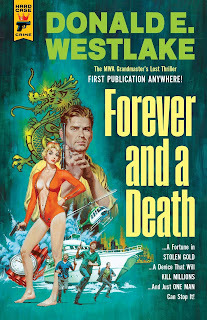 The one and only problem I have with Donald E. Westlake’s Forever and a Death is in the above press release. It’s all about how this book once could have been a Bond film, it’s marketed as a Bond that could have been, it leaves any reader not familiar with Hard Case Crime or Westlake expecting Pierce Brosnan to show up at any moment and, even whilst enjoying the first 80 odd pages, I was doing exactly the same. Eventually my brain kicked into gear, I realised which characters were essentially the Bond figures, and what unravelled was an excellent thriller full of intrigue, action and evil intent. Richard Curtis (not the Blackadder creator although that would have been awesome) is as convincing a villain as you can get in these types of thrillers and the concept of using his Soliton, a sort of tsunami set up that can level islands to make them ready to build upon, in nefarious ways to rebuild his once vast fortune appeals to me probably more than it should. He is a threatening figure but not thuggish; the kind of evil kingpin that I really enjoy reading about, using an inbuilt sociopathic nature and his business acumen more than weapons and violence, and I must admit to being more drawn to Curtis than any other character. What that says about Westlake’s writing is for my therapist to decide, but having an evil protagonist this good on the page means the reader really can buy into the attempt to stop him. Volunteer diver Kim Baldur, from the book's version of Greenpeace, nearly dies when Curtis first shows the Soliton's power but is found alive, and kept alive, by Curtis’ chief engineer George Manville and it's these two characters that share the tropes Bond would have used if Forever and a Death had become a film. I like the fact it takes two very different personalities to do what Bond could do, and the almost unexpected nature of these particular non-espionage types teaming up to stop Curtis is incredibly pleasing. The book takes in multiple locations, Singapore, Hong Kong, Australia, islands in the middle of nowhere, and carries through its pages some great twists and turns. 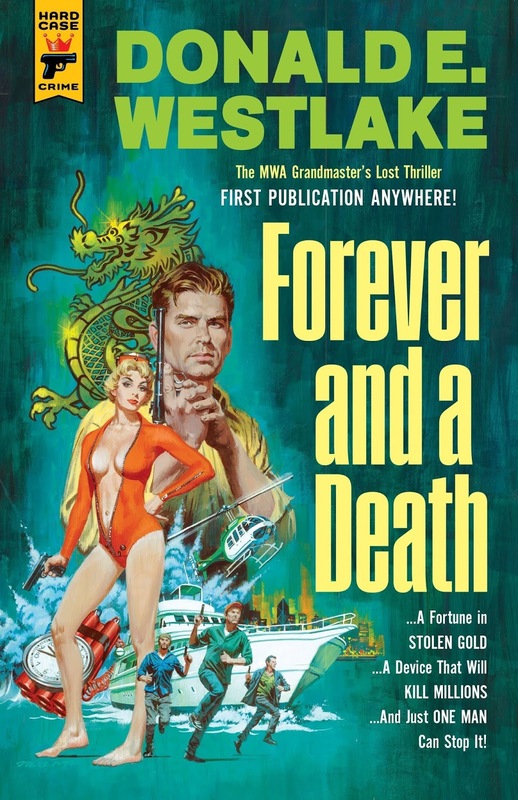 Forever and a Death is a fantastic read and the book works as just a great thriller, the Bond marketing is harmful in my opinion. Forever and a Death is out now in Hardback and in Paperback on 19th June.